The system which delivers residual fuel from the daily service tank to the diesel or boiler, must bring it to the correct viscosity by heating.For burning heavy fuel oil in a boiler furnace, or a compression-ignition engine, it is necessary to pre-heat it. 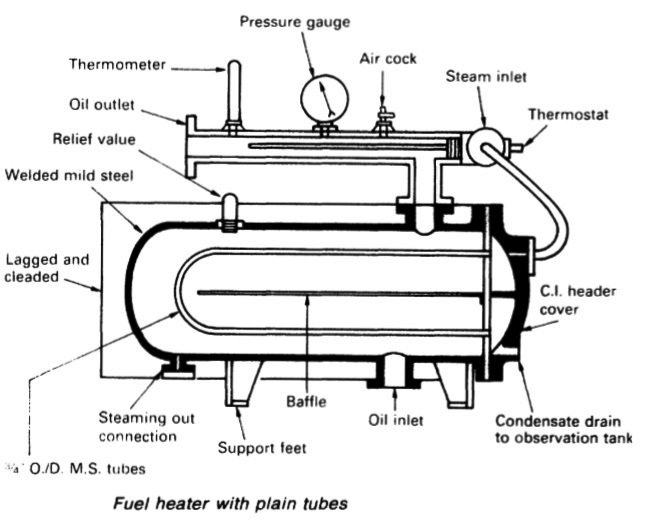 This may be done in a shell and tube unit either with plain tubes (Figure 1) or tubes with fins bonded to them (Figure 2) and the oil flowing on the outside of the tubes. The heating medium is normally steam but additional electric heaters are useful for start up from dead ship condition. The heating steam is used most effectively if it condenses during its passage through the heater, and donates the large amount of latent heat as it reverts from steam to water. A steam trap is fitted at the steam outlet from the heater, to make sure that only water returns to the observation and drain tank. If the trap fails, it is necessary to close in the steam return valve to achieve approximately the same effect (about a half or a quarter turn open). Thermostat control may be employed for fuel heaters (Figure 1) with the setting based on a chart showing variation of viscosity with temperature. The charts may not of course be accurate for a particular fuel. Better results are achieved with viscosity controllers, which are used to control viscosity directly, through control of the steam supply.